You may know Dr Ben Goldacre from his ‘Bad Science’ and ‘Bad Pharma’ campaigns, which fight misinformation around medicine. Ben has just launched his latest project, the AllTrials Transparency Index — and mySociety helped with the website side of things. The AllTrials campaign focuses around the fact that a shockingly large proportion of clinical trials do not have their results publicly published. Not only does this devalue the time, goodwill and even potential risk put in by participants, but there are also issues around bias. Those trials published tend to be the ones which show positive results: if that doesn’t sound like such a terrible situation to you, try playing this game from the Economist magazine, which graphically depicts the problems with skewed coverage. At worst, such selective publication can be dangerous, or lead to poor choices from bodies making medical purchasing decisions. 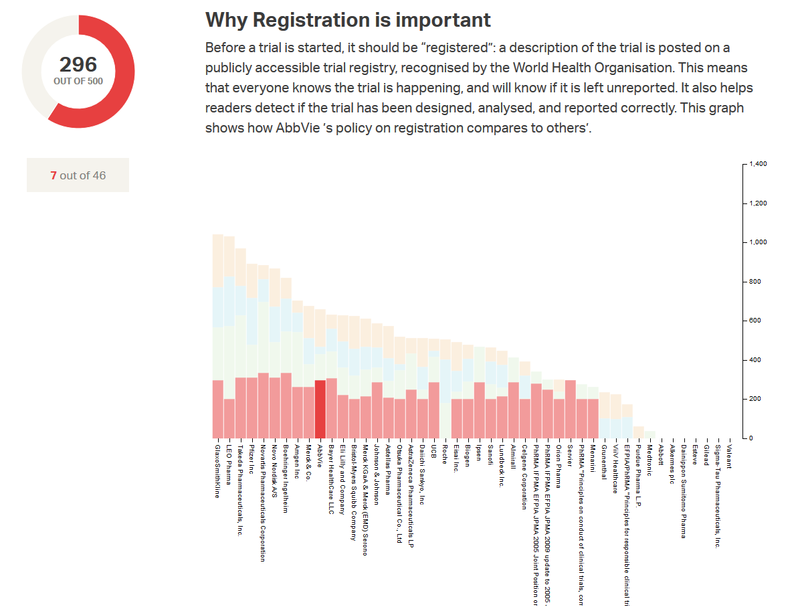 Transparency and data visualisation are two areas where mySociety has a long history, and so it came to be that we fashioned the deceptively simple AllTrials Transparency Index site, on which anyone can browse the transparency index of the world’s major drug companies, and dive in deeper to the data to see how it was compiled. The source data is free for others to download too, so anyone can integrate it into other projects. That’s the part that anyone can understand — and now, notes for the more technically-inclined who may be wondering how we took the data on each drugs company and presented it in a way that can be quickly and easily taken in. This is an ongoing campaign with a commitment to future audits, so we wanted to make it easy for the AllTrials team to update the site and republish the source data each time they do. It’s a static Jekyll site. We wrote a custom plug-in to parse a CSV and produce a page for each company within that CSV, as well as creating some summary data that feeds into the graphs on the front page. This data is then pulled from the CSV, and D3 is employed to build the graphs and insert them into the generated pages. The end result is a site that looks good and which can automatically update whenever the underlying data changes. We hope we’ll have played a small part in helping to ensure that it does — and for the better.